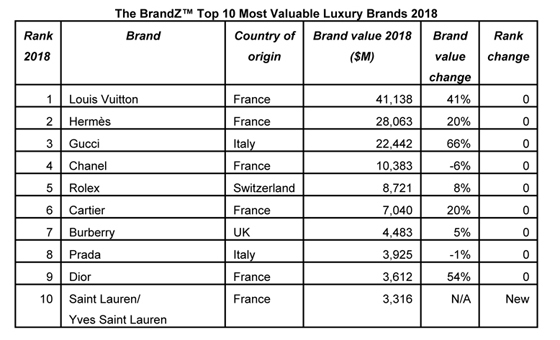 The value of Luxury Brands grew by 28% over last year, helped in large part by Asia millennials, according to the 2018 BrandZ Top 100 Most Valuable Global Brands ranking announced today (May 29) by WPP and Kantar Millward Brown. Consumers are seeking excitement, happiness and escapism through luxury brands, says the study. The pace of growth of the BrandZ Luxury Top 10 has grown seven-fold over the last 12 months from just 4% in 2017, and now has a total brand value of $133.1 billion. Gucci stole the show this year as the Luxury brand category’s fastest riser, growing its brand value by +66% to $22.4 billion. Retaining its no.3 position in the Top 10 Luxury brands ranking, Gucci demonstrates how luxury fashion brands are embracing digital technologies such as Instagram and other social media channels, to share their latest collections with a younger millennial audience. Louis Vuitton retains its position as the no.1 most valuable luxury brand and is also the third fastest riser in the category, growing +41% in brand value to $41.1 billion. Dior (no.9) was the second fastest rising brand, growing +54% to $3.6 billion. Six of the brands in the Top 10 Luxury Brands ranking were French, an increase with the addition of new entrant Yves Saint Laurent at no. 10. BrandZ points out that YSL is also engaging younger audiences with virtual and augmented reality technologies to promote new perfumes such as Mon Paris. At the same time, it is staying true to its brand heritage and loyal customer base by commissioning new advertising campaigns featuring 70-something former Yves Saint Laurent muse, Betty Catroux. Instagram, itself a newcomer in this year’s BrandZ Top 100 Most Valuable Global Brands at no.91, is proving pivotal as a way of rejuvenating heritage brands. Two of the leading Luxury brands, Gucci and Louis Vuitton, have been particularly successful in their use of the technology, each with over 23.4 million Instagram followers. These brands are using social media to appeal to millennial customers to great effect with a clear correlation between followers and sales to a new generation of younger customers via digital channels. While Gucci’s digital competence has contributed to the reinvention of its brand, the appointment of creative director Alessandro Michele, hiring street artist Trevor Andrew, aka GucciGhost, to collaborate on new collections and celebrity endorsements by Rhianna, Brad Pitt, Rachel McAdams and Salma Hayek have proved popular with millennials keen to express their identity with higher-end products. UK brand Burberry (no.7), regarded as one of the first adopters of digital change, increased its brand value to $4.48 billion and partnered with the online fashion platform Farfetch as a move to target younger, fashion-conscious consumers and make its products more widely available in over 150 countries. Luxury brands including Prada (no.8) and Yves Saint Laurent (no.10) also partnered with Farfetch. Led by mobile, digital revenues rose in all regions with strongest growth in Asia Pacific. Partnerships are proving effective for brands wishing to offer distinctive products and services, and Burberry’s collaboration with Russian designer and leading streetwear brand Gosha Rubchinskiy is one of many ways it is widening its appeal to younger consumers. Demand from Asian regions, particularly China, has added to the growth of Luxury this year, with companies such as LVMH, the world’s biggest luxury goods maker and parent company to 70 luxury Houses, reporting strong sales in high-end handbags, clothing, champagne and spirits. Overseas travel and business trips outside mainland China have added to the consumption of luxury items, particularly among the ‘Moonlight Clan’ – a name given to Chinese millennials that spend all their money by the end of the month. This represents a departure from traditional spending habits of older generations in a country renowned for its high savings rate. Hermès (no.2) has increased its brand value by +20%, growing to $28.1 billion as it invests in growing its online presence in Europe and stepped up its digital innovation in China with the launch of its first WeChat pop-up store. Note: Only three of the luxury brands in the Top 10 Luxury Brands ranking made it on to the overall Top 100 Brands list: Louis Vuitton, at # 26, L’Oréal at #44 and Gucci at #54. L’Oréal Paris is the world’s most valuable personal care brand for the sixth year in a row, according to the 2018 BrandZTop100 Most Valuable Global Brands ranking compiled by WPP & Kantar Millward Brown. L’Oréal increased its brand value +9% to $26 billion over the last year following successful strategies to build loyalty and become more customer-centric. The premium brands on the list delivered the strongest performances over the past year. Shiseido grew by 42% to be number 12 while Estée Lauder rose 29% to the ninth position. 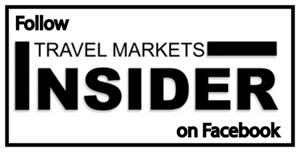 Among other premium brands popular in travel retail, no. 4 Lancôme and no. 6 Clinique both grew by 20% in value over last year. 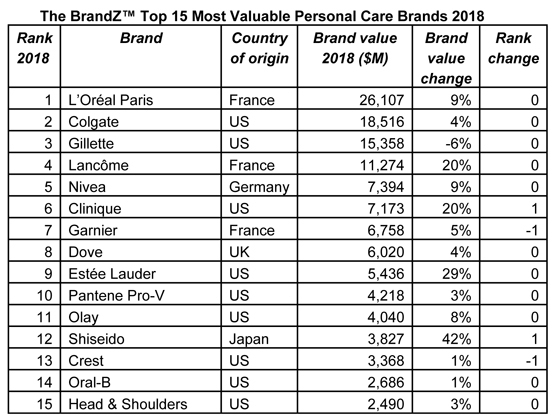 The total value of the BrandZ Personal Care Top 15 increased +8% in the last year with all names increasing value with the exception of Gillette, which decreased by 6%. The BrandZ ranking measures consumer brand perception along with financial data to calculate brand value. Mexican beer Corona is the most valuable brand in Latin America, overtaking Brazil’s Skol, which has held the title for the past two years, according to the sixth-annual BrandZ Top 50 Most Valuable Latin American Brands, released in April. Corona rose 8% in brand value growth to $8.3 billion, edging out Skol, which grew by just 1%. Corona is sold in more than 180 countries and its success and global growth have been helped by its ability to generate an affiliation with the “fun-loving” attributes associated with Mexican and Latin culture. Chilean retail giant Falabella, for example, (no. 6 on the list) has grown its brand value by 26% to $5.4 billion, by, among other initiatives, being the first in the category to develop an online platform with full range of products, as well as offering a valuable experience that is continuously reviewed and combined with a clear purpose of knowing and satisfying increasingly demanding consumers. While the economy has undoubtedly contributed to this year’s more positive ranking – GDP growth of 1.3% across the continent — it is only part of the story, says BrandZ. Latin American brands have also benefited from a strong affinity and pride among local consumers for brands from the region, as they believe they better understand their emotional needs. There were eight new entries in the BrandZ LatAm Top 50 this year: Globo (no. 8), Ypé (no. 33), Azteca (no. 37), Embratel (no. 40), Lojas Americanas (no. 46), Net (no. 48) and Porto Seguro (no. 50). All are from Brazil, except Azteca which is based in Mexico. Mexico dominates but Brazil is catching up. For the fifth year the ranking was dominated by Mexico, which contributed 35% of the total brand value of the ranking.Brazil however was close behind at 34%, with strong performances by its retail and financial players. Chile was in third position at 16%, followed by Colombia at 7%. The rise of local giants with strong brands that are capable of challenging global competitors is a trend that’s also been observed in other BrandZ rankings from China to Indonesia. This year’s BrandZ Latin American ranking, for example, shows a strong performance for local financial institutions (up 46%) and the four beer brands in the Top 10 – Corona, Skol, Brahma and Aguila – all controlled by global giant AB InBev, have maintained and invested in their local characteristics enabling them to boost brand value. To see full study, please click here. Carried out by WPP’s marketing and brand consultancy Kantar Millward Brown, the BrandZ Top 100 Most Valuable Global Brands ranking is now in its thirteenth year. It is the only brand valuation study to combine interviews with over three million consumers globally with analysis of the financial and business performance of each company (using data from Bloomberg and Kantar Worldpanel). In order to identify the dollar amount a brand contributed to the overall value of a corporation, BrandZ combines measures of brand equity based on interviews with over three million consumers about thousands of brands, with rigorous analysis of the financial and business performance of each. The BrandZ rankings are the only brand valuations in the world that take into account what people think about the brands they buy.